The powerful new Xcelerate technology ensures high performance and fast boil time when cooking outdoors, especially in windy conditions. 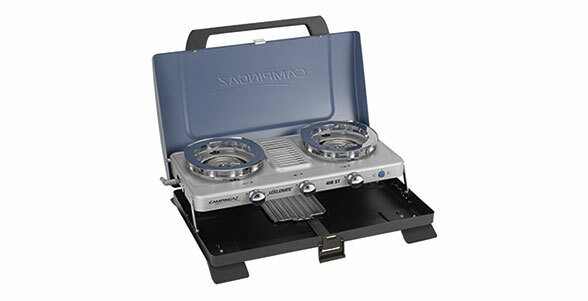 Featuring two Xcelerate burners and an additional infrared grill that is perfect for toasting. Packing away is made easy - simply fold down the 400ST and the integrated sturdy lid protects the appliance and carry handle makes it ideal for transportation. (at 3 m/s wind speed) 1L in 10min. Cut your boil time in half with Xcelerate™ Technology. The combination of the Xcelerate™ burner and wind blocking pan supports provide the ultimate wind resistance for your gas stove flame. With Xcelerate™ you speed up your cooking time and by that reduce gas consumption. Xcelerate™ - The patented burner technology creates lower yet powerful flames and features a downstep burner design, which makes the flame more wind resistant, producing results unmatched by regular burners. WindBlock™ Pan Support - The patented pan support technology creates a barrier around the burner that provides superior wind deflection.